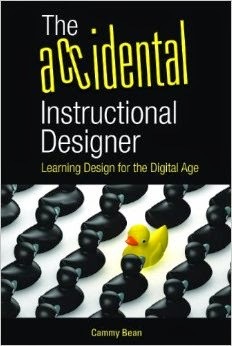 Cammy Bean's Learning Visions: Instructional Designers: To Degree or Not Degree? Instructional Designers: To Degree or Not Degree? About 63% of practicing IDs do NOT have an advanced degree. 16% of those without degrees say they have been declined work because of that. 58% of respondents work in the corporate sector. Here are the latest survey results if you want to see more details. If you're thinking about going down the advanced ID degree path, be sure to check out the eLearning Guild Research report by Patti Shank: eLearningDegrees and Credentials: Needs of the eLearning Professional. Wow, 63% don't have degrees. I knew the number was high, but didn't think that high. One thing - on #2 of your survey, I was scrolling down the response list and noticed that a lot of the responses that are listed as "Other" could actually be put in the "Instructional Technology" block. As you know, we are called many things ;-) and many have the same degree but call it toe-mah-toe instead of toe-may-toe. David, your absolutely right and I'll be the first to admit that my survey is probably not the most "scientifically robust." The response lists, however, can show what people majored in as undergrads, etc. -- so not advanced degrees. It is interesting to see most do not have degrees, not interested in getting a degree, less than 10 years in the industry, and work in corporate training. If you started this four years ago, I'd be curious as to a more current pulse. Nice job and thanks for running this! Hi Cammy - from working in this industry for 20 years now these stats do reflect the reality that many people move into e-learning usually from related professions like education & training or sometimes just from other industries! I did do a specific Masters degree in this field but in my experience most do 'courses', are coached by colleagues or are self-taught through engaging in great communities of practice. It's actually sort of discouraging - I'm close to having a Masters in ID and wonder how I will ever compete in the marketplace. I chose ID over educational technology because the technologies will change and I wanted to understand the theory. However, when looking at job descriptions, it seems to be tech experience that matters most.